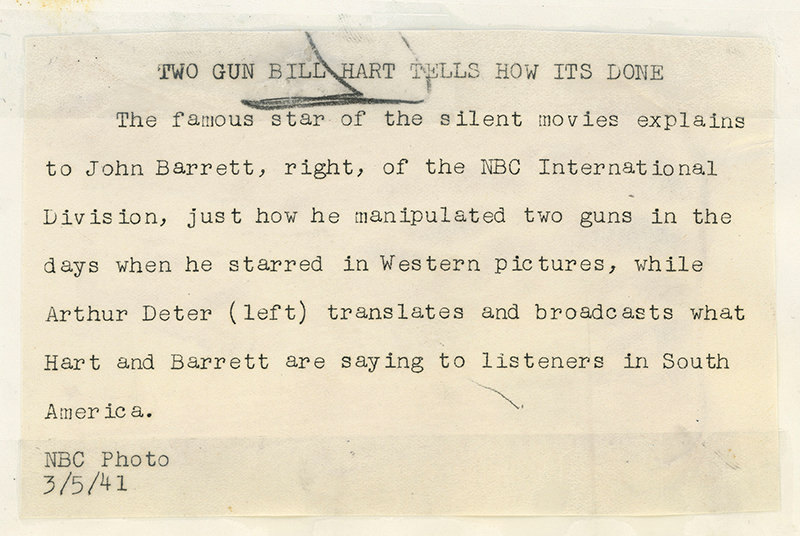 SCVHistory.com LW3228 | William S. Hart | Hart Describes Gun Work for Latin American Radio Audience, 3-5-1941. 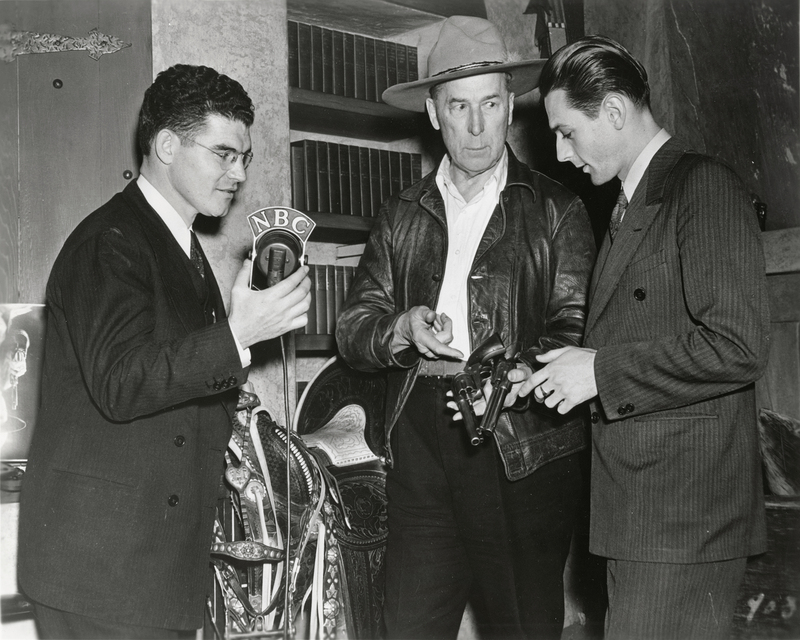 AS SEEN ON THE RADIO — Newhall's own William S. "Two-Gun Bill" Hart discusses his ambidextrous handling of two pistols while NBC's Arthur Deter (left) translates into Spanish for a Latin American radio audience on March 5, 1941. Some newspapers, such as the Hartford (Conn.) Courant, ran this 8x10-inch publicity photograph and extended caption as wild art. At least one newspaper (State Journal of Lincoln, Neb. ), below, used it to illustrate a feature story on the United States' new initiative to use the airwaves to win hearts and minds in Latin America, where Hitler, Mussolini and Stalin were already ahead of the game. The story ran in April 1941; the U.S. would enter World War II that December. You might say Hart was playing his part as a goodwill ambassador in the run-up to the Second World War, much as he aided the previous war effort as a pitchman for Liberty Bonds. The famous star of the silent movies explains to John Barrett, right, of the NBC International Division, just how he manipulated two guns in the days when he starred in Western pictures, while Arthur Deter (left) translates and broadcasts what Hart and Barrett are saying to listeners in South America. U.S. and South America to be Linked Soon by Radio Networks. Uncle Sam is Strumming a Vigorous Anti-Axis Serenade. Uncle Sam's broadcasters are making, this year, an "all out effort" — to borrow a current expression — to capture the radio audience in South American republics. This effort is the upshot of a program which came into being in 1937 when this country took the lead in a Pan-American movement to solidify the western hemisphere against inroads, political and economic, being made by the dictator nations across the Atlantic. It was at that time that U.S. broadcasters discovered the South American audience was listening largely to the Olympian voices of Berlin, Rome and Moscow, catapulted across the Atlantic over powerful short wave beams. U.S. stations were weak, generally pursued a "hands off" policy toward our neighbors to the south. Awakened interest in South America has given U.S. radio a new field to explore. Within the past year developments have hit a rapid pace. The broadcasters believe they are slowly wooing listeners to the south away from the totalitarian stations. They feel our vigorously strummed "good neighbor" serenade is paying dividends. This has been accomplished in several ways. The immediate problem facing U.S. broadcasters was to increase the number and variety of programs sent to South American nations via the short waves. For example, in 1937 NBC was broadcasting nine and a half hours a week to South America. This has been increased to a point where NBC is now sending programs totaling 12 hours daily to the southern republics. Similar increases have been made by CBS, and a half dozen other short wave stations now "beaming" programs specifically at South America. Latin Americans enjoy news broadcasts most. That is Uncle Sam's "ace in the hole." South Americans have expressed a decided preference for U.S. news broadcasts because they are generally free of the propaganda mixed in with the news broadcasts from dictator-controlled stations. As a result, news programs have been expanded considerably and now constitute the main item in U.S. broadcasts. In addition, the news, formerly given only in Spanish, is being broadcast in several different types of Spanish, and in Portuguese and other lingual minorities in South American nations. U.S. broadcasters have also corrected grievous errors in programing made at the outset of the "good neighbor" expansion. They have, for example, eliminated the variety show which is No. 1 fare in this country. Our comedians fall flat in South America. Another mistake was serenading South Americans with South American music. Letters received at NBC from its South American listeners indicate they like jazz tunes just as much as domestic listeners. Consensus of the letters was: "We'll play our own rhumbas if you'll only give us boogie woogie." Next to news, however, the average South American listener likes classical and operatic music best. This past season NBC broadcast the Metropolitan Opera Saturday afternoon matinees to South America. The programs brought in the heaviest fan mail response NBC has yet experienced — about 500 letters a week. Typical of the comments received from South American listeners was one from a radio official in Columbia. He said, "Your operas do more here to improve understanding and co-operation between the American nations than would a whole year of political speeches. We never fail to 'visit' New York by radio on Saturday afternoons. Now we feel we are more a part of the great hemisphere of nations, in peace." Also high in listening interest in South America is gossip and news about the film stars. The short wave programs also include rebroadcasts of symphonic programs such as The Voice of Firestone and the New York Philharmonic, heard over domestic long wave networks. The biggest development in the past three years came, however, when the FCC granted the broadcasters permission in 1939 to send sponsored programs to South American listeners. At present about two dozen sponsors interested in the market there are on the short waves. Despite the upturn in interest in U.S. broadcasts, South American listeners still complain that Uncle Sam's short wave voice is still the weakest. Steps are being taken to remedy this situation. This summer the technical side of the short wave battle for South America will be solved. Now nearing completion are six big powerful short wave stations which will blanket the South American airwaves. Each is powered with 50,000 watts, but actually the combined strength will be considerably higher — perhaps equivalent to 10,000,000 watts — because the waves will be directed on narrow beams to South American nations. The directional beams concentrate the power. Without a beam, the waves spread thinly over a wide area, reduce the signal strength. Here will be the short wave battery of good will ambassadors, all 50,000 watts: WCBX and WCRC both being built by CBS, in New Jersey; WGEA at San Francisco and WGEO at Schenectady, operated by General Electric Co.; WNBI and WRCA, built by NBC in New Jersey; WRUL and WRUW both operated by the World Wide Broadcasting Corp. of Boston. In addition. WLWO, operated by the Crosley Corp. in Ohio, is now broadcasting on 75,000 watts power to South America. A strong "ethereal bridge" will link the U.S. and South America, yet this short wave development seems likely to be only incidental to another radio development now taking place south of the Rio Grande. South America has an estimated radio audience of about 15,000,000 families. Most of their sets are equipped for long and short wave reception. Yet broadcasters have learned that only about 5,000,000 regularly tune in the short wave broadcasts, depend on their own long wave stations — of which there are a number of excellent ones — for the remainder of their listening. With this in mind William S. Paley, Columbia Broadcasting System's enterprising president, toured South America last winter to organize a South American network of CBS stations. When he returned he had signed contracts with 64 stations in 18 of 20 South American republics. The network will go into operation on September 1. NBC has followed suit. During the past winter a score of stations have been rebroadcasting NBC network programs. A number of them have been sponsored such as the Metropolitan Opera broadcasts, the Voice of Firestone, Musical Americana and the Madison Square Garden boxing matches. The Crosley Corporation, operating the powerful 75,000 watt WLWO short wave station, now has representatives in South America organizing a network of stations to rebroadcast WLW and Mutual network programs. These networks will be linked to the U.S. by the powerful short wave stations now nearing completion. A new approach to the South American listener, through his own local stations, is being made. "In almost all cases our (South American) affiliates have agreed to carry our programs for at least one hour a day. The programs will be built especially for Latin America, and with the wealth of information we have now gathered, we should be able to produce programs that will do justice to our feeling of friendship for that section of the world and its people. And we hope that by reflecting the kind of people we are, our culture, the things that move us and amuse us, our efforts will help make that friendship reciprocal. "But this is only one-half of our agreement, and I am convinced more now than ever that the other half is of equally vital importance and that we can no longer afford to remain ignorant of the achievements of Spanish and Portuguese-speaking America. We hope the programs that our Latin American affiliates have agreed to send us for retransmission throughout the U.S. will help to fill a serious gap in our knowledge of this hemisphere. Latin American countries are rich in musical, literary and artistic talent. "Most important of all is our desire to make this network a two-way street, to hear from Latin America as well as to be heard. Valuable as it is for us to humanize the conception of the "yanqui," it is equally important that we should remove our image of Latin Americans from the realm of prejudice and conjecture. For at least a decade we have been aware that our earlier dollar-diplomacy techniques of dealing with our neighbors — everything from music to marines — must give way to a more adult policy. "But diplomacy can do little to bring about good will so long as the U.S. citizen thinks of the rest of the hemisphere as a collection of countries that produce rhumbas and want loans. The programs that we shall soon be receiving from all the countries of Latin America will, I hope, banish some of our ignorance and give us an intimate and much needed introduction to the widely varying cultures and histories, the likes and dislikes of their people." LW3228: 9600 dpi jpeg from original photograph purchased 2018 by Leon Worden.